When Tchernobog's Cabal has fallen, there's millions of challengers vying for your throne out there in cyberspace. Be sure to hone your skills against the enhanced FrikBots (R) before defending your title in online bloodbaths. This is a standalone game. Blood is not required to play Transfusion. ...so I'll have to rate it later. Looks good though, at first glance. You can get some idea from the robots, though - try 'del'. Date: 2002-11-10 21:05:49 User: tomble Subject: Too much in one chunk! Whilst I don't usually like FPSs that much, I did like Shogo, which was also by Monolith (I've no idea if the games are remotely similar, prolly not), so I was fairly interested, and took a look at the download page. 36MB??? I'm on dialup, and my ISP drops connection frequently. Even with wget or curl or something (to resume incomplete dls) I doubt I could download this much. For the love of god, SPLIT THE THING UP!!! Or alternatively, don't, but you'll have at least one less player. For a start, source ought to be available separately from data files, but then surely the data files could be further split into sections, like maps and textures and things. Perhaps that just isn't possible. Oh well. This is a pretty good game. Never played Blood, but I can tell deathmatch will be awesome. Can't get resolution to 640x480, though, so I don't get so good of frame rates. It's playable, however, with bots. Date: 2002-11-12 15:09:02 User: anonymous Subject: Blood! I loved blood. This version is great, unfortunately without the single player mode that made the original so addictive. I couldn't find any servers online, so I just sort of jumped about a bit and fired at the walls. :-) Also: where are the mimes? You can't have a Blood remake without some mimes to blow up! Got it down to 640x480 and it runs excellent now. This game is pretty awesome. and replace "winex" with whatever program you are running. if you use "wolfspdemo" for the wolfenstein single player demo, it won't work..
You have to look through the wolfspdemo SCRIPT and find "wolfsp.x86" or whatever it is. After correctly determining the name to use, your program will now be able to mmap /dev/dsp and run. Thats what i always wanted. Blood running on my Linux Box. With Bots. I love the developers!!! Date: 2003-07-02 17:20:54 User: anonymous Subject: No servers to play online! Date: 2004-04-13 07:55:13 User: D.plomat Subject: Cool fun bloodbath! 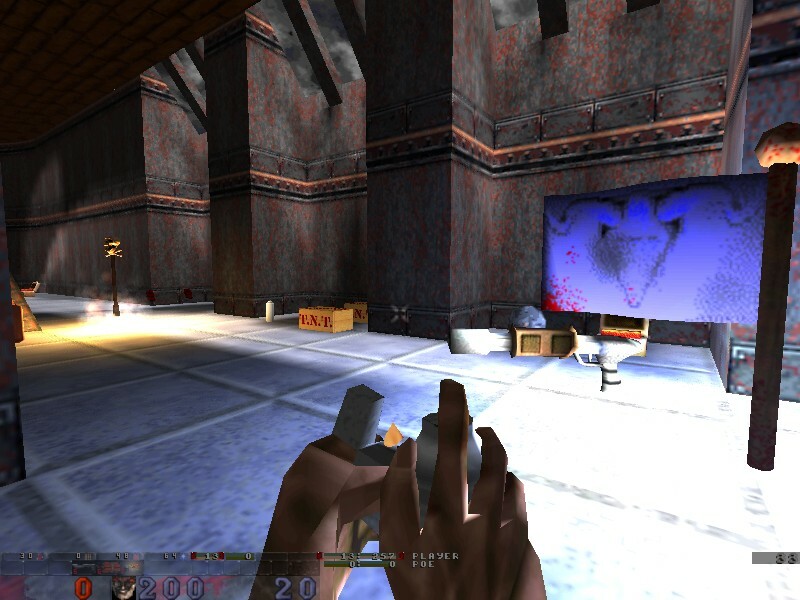 I cannot remember a game having deathmatch as well-done as Blood Bloodbath! And now I can have this experience again with Transfusion. Even online!!! It ROXX!!! Date: 2004-09-08 21:14:51 User: anonymous Subject: where are the 1.1beta3 linux files? Date: 2004-09-08 23:17:24 User: anonymous Subject: where are the 1.1beta3 linux files? Date: 2004-09-08 23:18:17 User: anonymous Subject: Re: where are the 1.1beta3 linux files? Sorry about the double post...I'm a nerf. Date: 2004-09-09 00:11:19 User: anonymous Subject: Re: where are the 1.1beta3 linux files? The Linux binary for i386 is into the ZIP archive, like the Win32 binary. It's called "transfusion-glx". You can also compile it by yourself by grabbing the latest source from the CVS repository of DarkPlaces (the engine TF uses) - http://icculus.org/twilight/darkplaces/, compiling it, and putting the binary into TF directory as "transfusion-glx". After making transfusion-glx executible ( chmod -c a+x transfusion-glx ), starting it ( ./transfusion-glx ) results in the message "FS_FindFile: can't find autoexec.cfg". Checking transfusion-1.1-beta3 directory and subdirs, I couldn't find autoexec.cfg. Playing shareware version, with modification. warning: most mods require full quake data. Date: 2004-09-09 14:58:39 User: anonymous Subject: Re: No servers to play online! some people have friends to play with..
if you want a server why not start one and give back to the comunity? Toddd is right, you don't need this file. Hit "ESC" and go to "Play online". If you want to play alone, just "create a new game". Or you can try to join a game if you're connected to the internet. Date: 2004-09-10 11:07:19 User: Kropemann Subject: !!! Is there any way I can express my love to you? My second favourite multiplayer shooter (After Tribes 2). Date: 2004-11-19 10:26:29 User: anonymous Subject: Re: Blood! Date: 2004-11-19 10:28:10 User: anonymous Subject: Re: Blood! But why does the Sourceforge page lists the license as "GPL/Proprietary"? "The Monolith developers" should read "The Transfusion developers".